Intrigued, I agreed and told her I’d never thought of my umbrella that way. As the sign changed to signal that it was safe to cross the street, Rosie and I started talking about her life, the women’s movement of the 60s and the current one now started with the #metoo movement. She told me that in her 72 years, she’s seen a lot in this world and last night’s speeches gave her hope and inspiration for the future. As we continued walking and I told her about raising three girls in this era, she said to me “Raise them to be kind. But more so, raise them to speak up, to fight for what’s right and to charge their own path.” I told her how interesting it has been to raise kids in this political climate and the questions that have come from my kids – seemingly simplistic questions with complicated answers. What she said next struck me. “Write,” she said. “Are you a writer? Write it down. Write a blog. Share it. Share your experience. 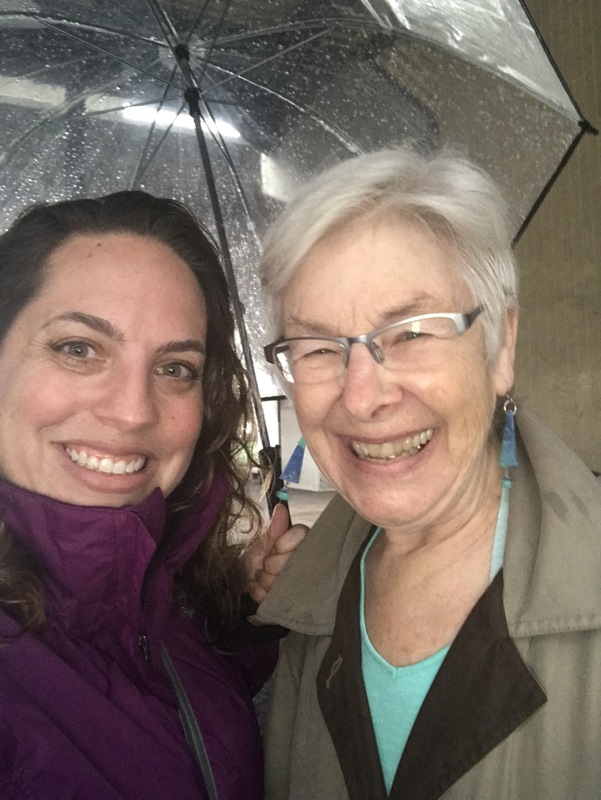 Share your words.” Given that one of my New Year’s resolutions was to get back into my blog and reinvigorate Finding Mom-me, she hit a chord and I told her I felt like she was a resolution incarnate. Normally I would have been looking at my phone, or listening to something on my earbuds. But today, at this particular moment, on this particular walk, on this particular corner, I wasn’t. 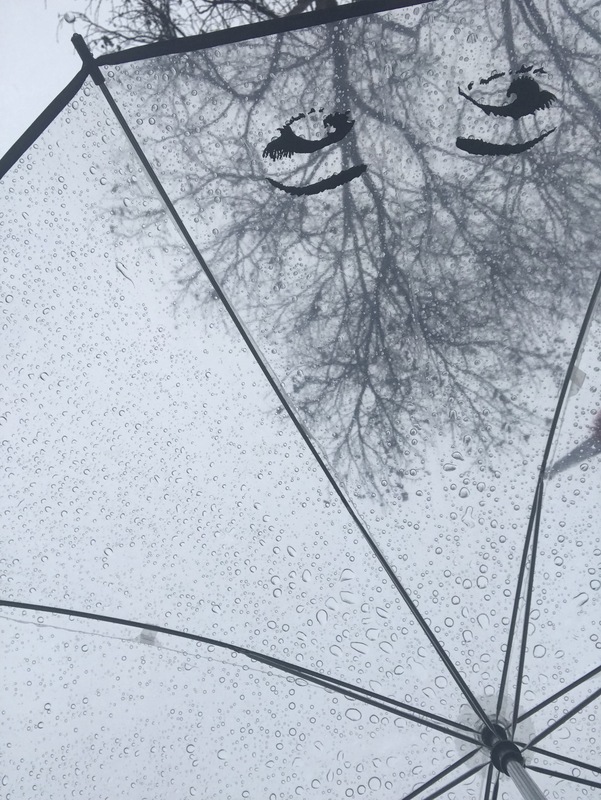 I was looking up, through the eyes of my umbrella and in that moment I shared an invaluable walk with a complete stranger (and walked 4 blocks out of my way because I didn’t want to stop walking). It definitely made me think and reinforced the feeling that I need to get back to my blog and find my voice in that medium again. I’ll save that for tomorrow, or some day soon. Today, I just want to enjoy the universe’s way of telling me that this particular resolution is right on track and to always be open to inspiration. Four years ago, I wondered what the future would look like. What would come of our presidential election and the many other seats up for grabs and propositions waiting to be approved. Four years ago, I worried and anticipated, wondered and hoped. Four years ago feels like both a lifetime ago and a blip on the calendar. Today is an important day for our country, and really, for the world. The outcome of today’s election will catapult us into the next chapter of our country’s story and will make history one way or another. Today we sit in anticipation as one day, one outcome, one moment determines the landscape in front of us. Four years ago today, I sat in a similar position, poised on a similar perch. However, that one was much more personal. Four years ago today, my second daughter was born (and on her due date no less!). And so, while we all wait and wonder what the future holds for our country, I write this blog post for her. Happy birthday, baby girl. It’s hard to believe that four years have gone by so quickly. I vividly remember waiting in anticipation of your birth and wondering when you would come… if you’d be early in time for the Giants to win the World Series (again) or as a our own little Halloween pumpkin. Then when October came and went, I wondered if you’d provide some much needed relief during the Obama vs. Romney election, or if you’d tease me and push all the way past your due date into the depths of November. I remember wondering who you would be, how you would change our family and how you would shape your sliver of the world. In the days leading up to and in the early stages of labor, we walked around the neighborhood to simultaneously get things moving faster and alleviate the pain of my contractions. We’d doddle from street to street and look at house paint colors while imagining how we would repaint our house one day. It was a haze of daydreaming nestled on top of real, primal emotion and pain as you prepared to enter the world. Perhaps that’s where your love of colors and tendency to doddle comes from. You’re welcome for that. On the day you were born, we waited in the hospital room as the epidural took hold of the contractions and gave me some much needed relief from the intensity of progress. That morning, a cloud paused seemingly only above the hospital and brought a dark violent rain quickly followed by a warm, healing sunshine that shone through the window into our delivery room. Not long after the sun danced on the linoleum floor and reflected off the medical equipment lining the walls in the room, you decided to make your entrance. This rainstorm has become synonymous with your personality – a lot of warmth and sunshine, sandwiched around moments of sudden bursts of intense “rain” (usually in the form of random tearful fits). When the midwife placed you on my chest and your daddy announced “it’s a girl,” the wave of emotion I felt was one I could never fully put into words (and clearly I like to use my words!). Your piercing blue eyes looked up at me with a knowing glance and immediately, everything else melted away. In that moment, I became a new mom for the second time and you flipped everything upside down. You, baby girl, took our family from a unit of three to a circus of four (and two years later your little sister turned us to a party of five). You made our first born a sister, and together you taught me the overwhelming bond of siblings that as an only child I’d never fully understood. You defined what it means to be the middle child in our family… less the quintessential, stereotypical middle sister and more simply the second of three. You are situated somewhere between wanting to be coddled as a little girl, and wanting to be a caretaker to your little sister (and sometimes to your big sister too). You bring humor, spontaneous dance moves and sensitivity to every situation. You are completely and unapologetically yourself and your individuality is something I hope you will continue to celebrate and embrace. This year, as you welcome your birthday with rainbows and unicorns (that’s not a euphemism, you really do love rainbows and unicorns! ), there’s a lot at stake for our country and the people all around us. You might sense that the air has more energy to it, that people are on edge and that something big is coming (or you may not…you’re four). But today, as we celebrate your birthday (and wait to hear the results of this election), I want to share a few wishes with you. Today, I wish for you to continue growing up in world in which you are valued, respected and honored. I wish for you a future where you can be anything or anyone you want to be, where your opinions matter and where you can make a difference. I wish for you to have the continued gift of confidence, innocence, and the amazing art of not caring what others think. I wish for you to be able to maintain the skill of truly dancing like no one is watching, to be able to love fully and deeply and to know that the future before you is bright. I wish for you to find and use your voice to stand up for what you believe is right, to ask for help when you need it, to protect the ones you love and to know that you’re protected too. I wish for you to struggle enough that you know how to overcome it but not so much that you feel that it has overcome you. I wish for you to find continued strength, determination and tenacity. I wish for you to continue being a ray of sunshine, even on a cloudy, random rainstormy kind of day. I wish for you to always know that you are loved. I wish for you to know that you are part of a big world but never let that make you feel too small. I wish for you the ability to slide on the moon, swing from the stars, jump in the clouds and slide down a rainbow ( all figuratively, of course… if you really did this mommy would have a nervous breakdown!). Happy birthday sweet girl. May today be a wonderful next chapter for you, and for our country. I love you to the moon and back. I have been waiting 365 days to write this blog post. 365 long, short, happy, sad, exciting, boring, fun, mundane, busy, slow, up and down days. 365 days that have each been unique… each their own snowflake within the year. Each day has tested me in its own way, making me better (even though some days I got worse first). When I walked away from a job I loved one year ago yesterday, I vowed to myself that I’d write and publish a post exactly a year and a day later reflecting on what I’d learned through my new role as a stay at home mom. Of course, at that time I didn’t predict that I’d spend the last four months of that year crippled by terrible writer’s block, with a head full of content and observations to share but an inability to translate them into shareable material. Perhaps that itself is the metaphor for my year…. a jumble of emotions and experiences too great to put into words. Or maybe, I’ve been so consumed by being home with my kids that I haven’t had a chance to reflect on what that has meant. Or maybe, the words haven’t come as easily as they once did. At any rate, I’m here now because I promised myself I would be, and that is a promise I intend to keep. When I started out these last 365 days as a stay at home mom, I had great expectations of what that would look like and I’m simultaneously proud and saddened that I didn’t live up to much of that. I had lists, spreadsheets, projects, recipes, ideas and plans… most of which still sit in the same format that they did when I’d initially put them together, completely untouched. It’s not that I failed or that the expectations were too lofty, but rather that I had no idea what my days would be like until I lived them. Until I was the hot mess mom running her kid into her classroom late… again. Or the completely with it mom who planned great birthday parties. Or the mom who baked cookies and sat in the backyard making wishes on dandelions with her kids. Or the mom who had all the time in the world and yet no time at all to get anything done. I’ve been all these moms, and more. Being a mom is the best job I have ever and will ever have. Kids are resilient. They need a guide to help them navigate the world around them, but they are stronger and more intuitive than we realize. Going to the bathroom alone is a luxury. There will always be more laundry to be done and as much as you will it to happen, it will never fold itself. Sometimes a bowl of cheerios and milk is dinner enough. You can have ratings for your yoga pants, ranging from your nice ones to the ones you only wear around the house. Also, practicing yoga isn’t a requirement for wearing yoga pants. Watching too much television isn’t healthy, but sometimes the television is the best (and cheapest) babysitter around. Nothing teaches patience better than a child who asks “why?” all the time. Except for the child who says “mommy” on repeat for 30 minutes straight. Pinterest is a great place to collect ideas for projects you’ll never do and recipes you’ll never make. Put the date for a birthday party in your calendar. Check the date against the invitation. Don’t show up for the party a day early (or a day late for that matter). Siblings fight. Sometimes they need you to step in and sometimes they need to work it out themselves because you can’t be a referee forever. Every toy, shoe, and worksheet needs a home. I’ve yet to find a home for most of these things, but they need a home nonetheless. You don’t have to be perfect all the time. Or any of the time. Laughter is the best medicine. Kid laughter is the best form of it. Laugh with your kids often. Ask for help. Accept it graciously. Put the phone down. Sit on the floor and play. Burned toast is salvageable. Burned chicken is not. Find your tribe. Make friends. Talk to people. Being a mom (and being a parent, for that matter) is not easy. This list is in no way complete, but it’s a good start. I was sure that after a year in this new life I’d have some deep and profound thoughts about what this transition has been like. I thought that I’d have a true understanding of both sides of the field having been a working mom, a stay at home mom, and, as I do now, straddling the two. But the truth is… there is no truth. I don’t have a profound understanding, I just have my days. These last 365 gratifying, challenging, amazing days. We spend so much time fighting the “mom wars,” comparing our experiences to others, longing for something else or being completely rooted in where we are. Maybe for some the grass is always greener on the other side. Maybe the grass is perfectly green exactly where you stand. Or maybe the grass needs to be mowed, the laundry needs to be done, dinner needs to be made, work needs to be completed and the kids need to be bathed. It’s just grass, so do with it what you will. Today my parents are celebrating their 46th wedding anniversary. WOW! This milestone is pretty incredible. Since getting married, they have moved completely from the East Coast to the West Coast with a 40 year “layover” in Arizona. They’ve gotten their advanced degrees, and started and retired from their careers with pretty significant accomplishments and accolades to boot. They’ve made countless friends, traveled a good portion of the world, and raised a pretty awesome lady (if I do say so myself!). Today, for their wedding anniversary, I thought I’d dedicate this blog post to them. After all, a good portion of finding the “me” in mommy, comes from how they raised me. And a good portion of the “mom” in mommy comes from how they raised me, too. So, instead of a Hallmark card or a bottle of champagne at dinner, they get this blog post (is that the equivalent of those “someone I know went to some random tourist destination and all I got was this lousy t-shirt”? Man, I hope not!). As the only child of two educator parents, I grew up in a household that valued kindness, social justice, education, and above all, love. We were a small but mighty unit of three (except for one special year when we had an exchange student from Brazil who made us a happy family of four. Hi sis!). My parents taught me independence at an early age which allowed me to forge my own path and to become my own person from from the get-go. One of their favorite stories to tell is about the first time they put me on a plane alone to visit my grandparents in Southern California. At the age of five, my parents took me to the gate, told me the flight was the same length of time as an episode of Sesame Street (which, to my disappointment I soon figured out did not mean that the airplane would actually show an episode of Sesame Street), and handed me off to the flight attendant to board the plane. I said goodbye and didn’t look back as I walked down the jetway and onto the airplane. “You didn’t look back,” they’ve told me time and again. And, I’ve always just laughed it off and held that moment as a point of pride. Until this week. This week was my five year’s first week of summer day camp (another important part of my childhood). The first day, she gripped my hand tightly as the counselors introduced themselves and started a game for the kids to get to know each other. As she got more comfortable, I loosened our grip, first by standing next to her while we played, then sitting to the side while she played without me, and then giving her one last kiss as I walked away. And so, the second day I anticipated a similar progressive exit. But to my surprise, we got to the door of the camp building and she abruptly turned around, gave me a kiss and said “Mommy, I can go in by myself. I don’t need you to walk me.” Sure enough, she walked down the hall without turning back. And then I understood. I knew why that moment had been such an important milestone for my parents. They’d put me on a plane and sent me away for a week to stay with my grandparents; my experience with my own daughter was for 3 hours and was less than a mile from my house. But still, I finally understood. That independence that we so deeply try to instill in our children is a wonderful blessing, but man does it pull at your heart. As with most parenting decisions, there are always unintended (or maybe unexpected) consequences. Teaching me independence at a young age resulted in me leaving home at eighteen. Like many others, I went off to college in another state. But when I left we all knew I wasn’t coming back. Of course, I returned for school breaks, extended holiday weekends and family vacations in adulthood. But really, when I moved out to California after I graduated high school, I had no intention of moving back to my hometown of Phoenix. That was it – bye bye desert. And that’s how it was for fifteen years – me going back to Phoenix with my family or my parents coming to visit us here in Northern California. We made the most of our visits, but we all knew that those condensed weekends were jam packed with activity and emotion because there was just never enough time. So, when my parents retired from their long careers in education and moved last year to a new home just a few minutes down the road from us, that created an entirely new and special reality. Suddenly everything had come full circle. I’d left home all those years ago without looking back (just like before that first flight) and created a new home and new life for myself. They’d continued building their lives, careers and community in Arizona. And now, here we are, together again. The weight of their move is not lost on me and I count my lucky stars every day that it was possible. Living so far away from my parents for many years, I’d often felt jealous of my friends who had random movie nights with their moms or dinner out with their dads. But this last week, I saw my parents nearly every day. I took my dad to breakfast for a belated Father’s Day celebration. I spent a few days in my mom’s studio as she taught me to sew on her sewing machine. As a kid and even as a young adult, I never could have appreciated this time together. But now, I cherish it. I love that my dad can call us when he makes a dish for dinner that’s too spicy for them but knows we’ll like it, so he asks if he can bring it over. I love that my mom can take the time to teach me how to sew on a project that has taken months (even though it should have taken a few days) because we have the luxury of starting and stopping whenever we want to. I love that my kids can go to their grandparents’ house at 7am on a Sunday morning so my husband and I can get a little extra sleep. And I love that my kids are growing up with all of their grandparents (my parents and my mother-in-law) all only minutes away so they can be an active part of the kids’ lives and can attend sporting events, art shows, and special dinners out (and can watch the kids when we need to run errands or get in an occasional date night! Thanks everyone!). My parents are two of the bravest, strongest, smartest, and most loving people I know and I am inspired by them as individuals and as a couple. When they sold our home in Phoenix, I was sad about the loss of those memories, but what we have gained is so much more. And their house here is just as special as was the house in Phoenix. This year more than ever I’ve learned that a house is just a house, but home is where the heart is and my parents have two of the biggest hearts of anyone I know. Happy anniversary you two! We love you! Have a wonderful celebration! As parents, we put a lot of focus on firsts as important milestones… first words, first steps, first day of school… but focusing on the lasts is also an important part of this crazy journey we call parenthood. Last night in a crib, last time nursing, last day of school. I didn’t expect to feel emotional about my daughter’s last day of her first (there’s a tongue twister for you!) year of elementary school. After all, we had already celebrated her last day of preschool and her first day as an official elementary school student. Weren’t those the milestones to focus on? Yeah, I thought so too. But as tomorrow looms, my oldest daughter’s last day of school before her first (there it is again) “real” summer vacation, I’m strangely emotional all over again. Ready to be the letter “N” in her class alphabet parade. In some ways, it feels like her childhood is just beginning. The years leading up to this were largely toddler years, full of playdates, playgrounds and innumerable firsts. But beginning tomorrow at 11:17am, she will begin a summer vacation that represents much much more. She is on her path through traditional schooling, where she spends ten months learning inside a classroom and two months playing, exploring, and learning entirely outside of the classroom. This past school year has been just as much of a growing year for us, her parents, as it has been for our daughter. Prior to this year our entire school community and experience was wrapped up in a daycare/preschool. Our daughter’s friends had been the same babies with whom she’d covertly shared pacifiers. The challenges she had on the playground were with the same kids she saw as extended family because they were the only friends she’d ever known. The experience she had was loving and sheltered since she spent day in and day out in the same small classrooms from infancy to nearly five years of age. But this year, we became elementary school parents and entered into this next (huge) phase of her life (and thus, by extension, ours). We watched our daughter work to make friends, expand her education and truly blossom. We listened to her as she’d come home and report to us about the games she played and the occasional squabbles she had on the playground. We comforted her on the day this spring when she cried because another child had been particularly mean to her, and taught her how to stand up for herself when she felt that an injustice (of the five year old variety) had occurred. We watched as she read (like, really read) for the first time. And we noted, time and time again, how clear it was that she had transitioned to being completely and utterly a kid, not the little girl we still imagine her to be. She became aware of the world around her and its magnitude, as well as its potential harm. She put to use so many of the lessons we’ve spent the last first years teaching her – how to be a good friend, how to ask for help, how to question things and explore her curiosity. These days, we sit in awe as this little girl, this kid who turned us into parents in the first place, is continuing to challenge how we define parenthood. She went from being a preschool “graduate” entering elementary school to completing her first year of her traditional educational journey, and that feels just as big as the day she started. When I left my full time job last October, I knew I still wanted a foot in the professional world. It may not be mainstream, and it may not be right for everyone, but for me jumping into the world of direct sales was the perfect fit. I can work on my own time while still taking care of the kids, and I can use the skills I’ve honed over the last decade in customer service, sales, and analytical thinking to develop my own business. I’m so thrilled to share that Kveller.com has picked up a piece I wrote about why I chose this path and has published it on their national platform! Take a look by clicking here.